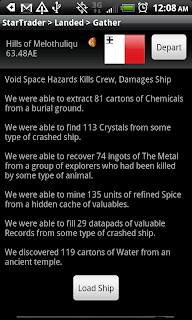 Carrying Artifacts Increase Chances of Solar Accidents for each Artifact. Each artifact that the Captain carries increases the amount of damage done to each area by +1%. So of the Captain is about to suffer 30 points of Accident damage and is carrying 20 Artifacts the actual total will be 36 points of Accident damage. For each artifact that the Captain carries the severity of the accident is increased by +2%. Carrying Electronics is a double edge sword providing benefits and penalties. Each Electronics in the Cargo hold Increases the rating of the enemy ships by +2%. Enemy ship Rating is divided between Ship Cost, AI Intelligence and NPC Captain XP. Carrying Weapons is a double edge sword providing benefits and penalties. Each Weapon in the Cargo hold Increases the rating of the enemy ships by +2%. Enemy ship Rating is divided between Ship Cost, AI Intelligence and NPC Captain XP. Carrying Records in the hold is useful. You may elect to carry miscellaneous trade supplies to help your officers. These bonus do not apply unless the officer is on board. These bonuses apply even with a single unit on board. Incredibly useful article. Thanks for writing this up! I refer to it often to strategize my cargo space and ensure maximum benefits from my missions and officers. This game has so much richness and depth!! !